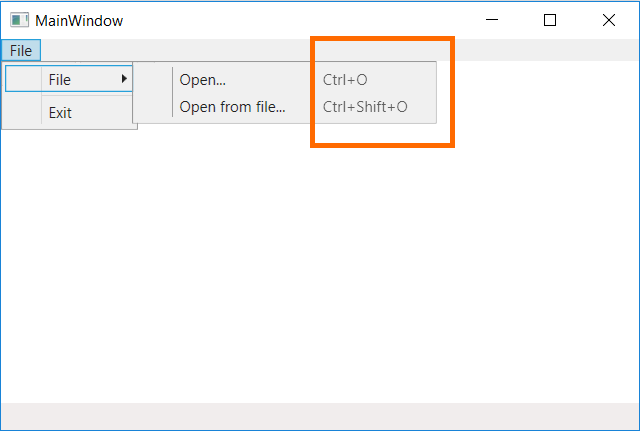 How can i databind a keyboard shortcut text (e.g Ctrl+O) to C1MenuItem similar to the default WPF MenuItem Property "InputGestureText"
There is no built-in property to set shortcut/hotkeys directly for C1MenuItem that can help us navigate through the menu using the keyboard itself. However, you can try with the below implementation. I forwarded your requirement to concern team as an enhancement. Will be added in the future build if it founds it's feasible. Thank you! The InputGestureText property works as exptected.